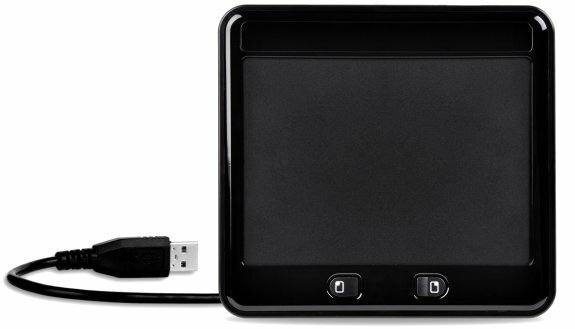 Speedlink introduced a multitouch trackpad for desktop PCs. It will be available this Fall, the wired USB version costs 24.99EUR and the wireless model will be priced at 39.99EUR. SPEEDLINK® introduces an innovative new Multitouch input device for the PC. Operated with intuitive finger movements, the SPEEDLINK® Multitouch Trackpad offers easier, more convenient control of the PC and home entertainment system- and also makes page turning during business presentations much more convenient. Following the success of the CUE Multitouch Mouse, SPEEDLINK® is proud to introduce another innovative input device featuring Multitouch technology. The SPEEDLINK® Multitouch Trackpad allows convenient control of your PC using intuitive finger movements. Thanks to Multitouch support, more complex commands are now possible- so not only can you control your pointer more accurately, but you can also scroll through your photo collection with one finger and rotate images with a simple circular motion. This makes the Multitouch Trackpad far more powerful than a conventional mouse. And its extra- large surface means it’s also much more practical than an ordinary laptop touchpad.